Discussion in 'Completed' started by LiOoN, Jul 17, 2018. Jakle, Slazzy, Winks and 2 others like this. LiOoN and Slazzy like this. Since 10 slot pet equips were reduced to 7, I believe we've also had the intention to level out the playing field and turn 5 slot pet equips into 7. LiOoN and Winks like this. Isn't the idea of 5 slot Pet equips that you can still switch pets. It's the trade off for not settling on one pet. Otherwise i wouldn't have picked a monkey specific item. 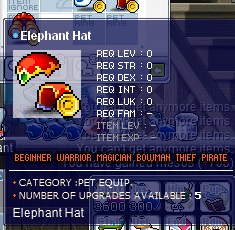 Well, if this was specified I wouldn't have picked a 5 slots pet equip either. I didn't even know it could have more nor it would be usefull someday. To solve these problems, I think there should be a way to transfer the att from pet equips, so we can switch and not be permanent bound to a single pet. Take as an example Krexel, the newest boss we got gives a pet. So most of us can't make the proper use of it unless we have an alt with out pet att equip. SweetPayback and Slazzy like this. 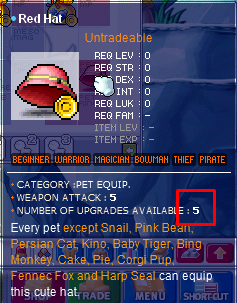 Well, if this was specified I wouldn't have picked a 5 slots pet equip neither. Small detail to keep in mind: Also transfer the DEX/STR/INT from the pet equip if you already scrolled it VS Resetting slots. I'm not sure about making the multipet Pet Equips have 7 slots like the specific ones; the number of slots is indeed supposed to be a tradeoff for the versatility they provide. there's also multiple pets for which pet eq doesnt seem to be otherwise available. - do the chipmunks have pet equips? there are also some pet equips which have 7 slots but which also work for multiple pets eg. the birthday candles from the recent anniversary event. Slazzy and Indie like this. 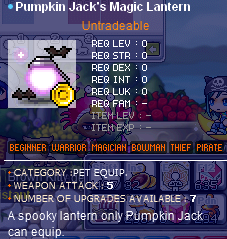 Birthday Candle is an example of inconsistency, unfortunately, as Nexon did not provide another equipment for the other pet (two different candle colors would have sufficed...). , but we probably haven't introduced them yet. It looks like a full pass on Pet Equipment is necessary, so we'll be fixing all the mistakes in a wz patch. I moved this thread to the Accepted suggestions, as it's something we'll try to implement asap. 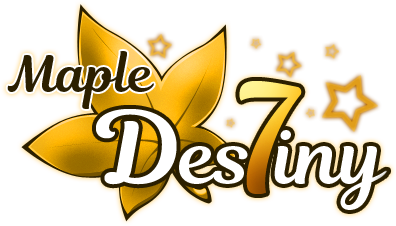 However, I changed the thread title, from "Make all Pet Equip 7 slots" to "Fix Pet Equipment inconsistencies", so that it's clear that our intent is not necessarily to equalize the slots amount also among the common equipment. Jean, Chae, LiOoN and 4 others like this. As per today's patch, all pet equipments have 7 slots, so this can be moved to Completed. A system to transfer Pet equipment stats to a new Pet equipment piece will be worked on, and will be available asap, in order for us to achieve perfect pet cosmesis equity. kagetsuki, LiOoN, panatown and 1 other person like this.